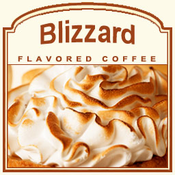 This Blizzard flavored coffee is a flavor mixture of thick eggnog, Jamaican rum, and cinnamon spice. If you love eggnog and want a little extra kick to it � this Blizzard is for you. With only 2 calories in each cup, this Blizzard flavored coffee will hit the spot with its irresistible sweetness that blends well with a creamy, warm spiciness. Let these 100% pure Arabica beans blow you away with the full-bodied flavor. A heat-sealed valve bag will ensure the freshest coffee possible, which is why this Blizzard flavored coffee will be roasted and shipped on the same day. If you want a pick-me-up in the middle of winter, let this Blizzard flavored coffee take your eggnog loving taste buds on an adventure. Perfect hot or cold, this Blizzard flavored coffee has a unique flavor that will awaken your senses!